At Steigerwald, Gordon & Koch Wealth Advisors we strive to build a long term relationship that benefits your life through professional financial planning and investment management that takes into account more than your assets. We get to know you as an investor that has unique needs and goals. To help you succeed, we help you articulate your financial goals and examine personal factors that can influence and impact how your portfolio is constructed – and how it is managed. Throughout our relationship we take great pride in listening to you and keeping the channels of communication open. We feel that ongoing personal planning can help build a long-term relationship with us that can result in greater peace of mind for you as an investor. 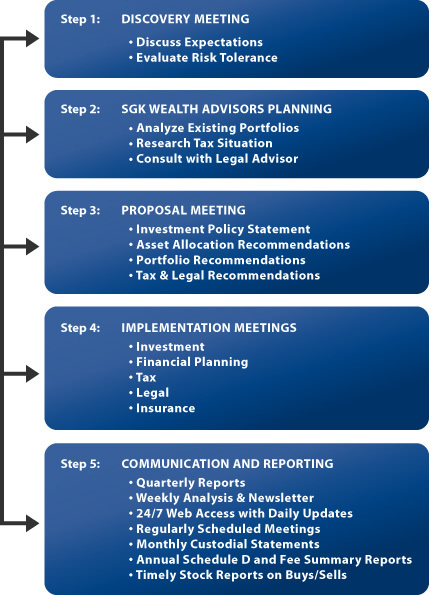 The process illustrated below addresses all aspects of our investment program and includes continuous monitoring of your portfolio.